Stopping assassins may keep Vin's Mistborn skills sharp, but it's the least of her problems. Luthadel, the largest city of the former empire, doesn't run itself, and Vin and the other members of Kelsier's crew, who lead the revolution, must learn a whole new set of practical and political skills to help. It certainly won't get easier with three armies - one of them composed of ferocious giants - now vying to conquer the city, and no sign of the Lord Ruler's hidden cache of atium, the rarest and most powerful allomantic metal. 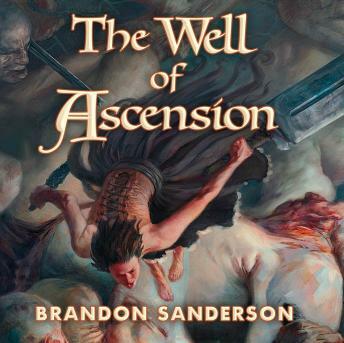 Brandon Sanderson' world and Michael Kramer' narration is absolutely ingenious!!! An outstanding read. Tremendous narrating and Sanderson does an excellent job of keeping the thrill going and developing amazing back stories for all characters. Great book! Great Narrator! Voices really make the book come even more alive. Was glued to this book from beginning to end despite "slow" parts in middle. The author really knows how to keep your attention through the ENTIRE book. Already listening to Hero of Ages now. I absolutely love these books and the narrator is awesome. If you love fantasy books this is one of the best series I've read in a very long time. Sanderson has a wonderful imagination and he's an excellent writer. The book was as good and the first. Sanderson is a phenomenal genius. Kramer's narration was awesome! Sanderson is a genius. Kramer's narrating is amazing. Downloading a the hero of ages now! Brandon Sanderson is a master. And I love every book Kramer narrates! Simply hypnotic!! Mr. Sanderson, you have earned a new fan. This continuation of the Mistborn series captured my imagination to the point that my friends felt neglected. The novel received the majority of my attention. The plot, the action, the characters, the build...Great Work! In addition, Mr. Kramer definitely knows how to deliver the goods! Normally I shy away from females protagonists in books, but this is absolutely inspiring. Great read/listen.